This past month, Shelley and I participated in the Slice of Life Challenge (SOLC) hosted by Two Writing Teachers. As part of the challenge, we wrote daily and read and commented on the writing of other “slicers”. Conversation during two Twitter chats this week, ShelfieTalk and G2Great, reminded me that one of the best ways to inspire students to reflect and set goals is to do so ourselves. In that spirit, I have made my last post for SOLC 2019 a reflection on this month and ideas for where I might go next as a writer. Morning is my favorite time of day. look forward to it each day. being more present in my life. and with an eye towards opportunity. Writing with others is empowering. This month has been a gift. A time for reflection and celebration. What do I hope for my life as a writer? Continue to blog regularly, definitely. Write daily, without a doubt. is to stay in the flow of writing. This is a wonderful piece of writing! 5 a.m. is my favorite time too–still dark outside, just me and the cats and my notebook. 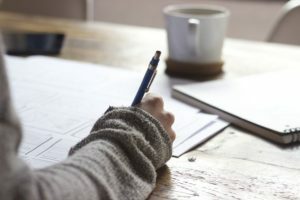 I love the lines about writing as meditation and strength in connectedness. I have been feeling sad about getting to the end of the challenge, but your post inspires me to think about how I will keep writing. This is a wonderful reflection on the month that FLIES by and yet gives us time to think! Having a writing routine is so important! I love waking early and blogging as I sip my coffee. Isn’t it amazing how the act of writing changes how you view life? Maybe I’ll see your name on one of the #G2Great chats. Thanks for sharing! This is the first time I’ve visited your blog, and I’m glad I did. “This month has been a gift/ a time for reflection and celebration.” I feel the same. Sometimes all we need is an invitation and fellow travelers.